Cleaners SW7 Ltd offers the best service with the latest cleaning processes like the steam heating and dry cleaning procedures. Our professional team of cleaners is well trained and hence we are the best people in SW7 to handle your home carpets with utmost care and attention.If you are not sure where to look for a reliable upholstery cleaning service, then your search ends here. We are the best sofa cleaners in and around SW7.Call us today on 020 83966319 or visit our website at www.cleanersSW7.co.uk for more information. The web server used by Cleanerssw7.co.uk is located in Saudi Arabia and run by OneNET For Information Technology Co. Ltd.. This web server runs a few other websites, mostly in the english language. 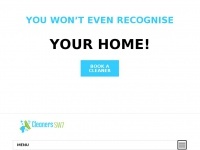 The websites of Cleanerssw7.co.uk are hosted by a Apache server and were developed in the programming language PHP. The HTML pages were created with the latest standard HTML 5. The website does not specify details about the inclusion of its content in search engines. For this reason the content will be included by search engines. Server provider: OneNET For Information Technology Co. Ltd.